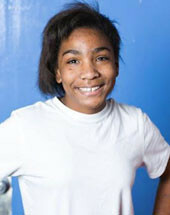 Mikayla is an outgoing and friendly child who typically gets along with other children. She enjoys wearing girly clothes and hairstyles, playing outside or doing arts and crafts. She's very creative and enjoys music too. Mikayla is still a little girl at heart, even with the growth spurt she has recently had. She is accustomed to having a very child-friendly extended family who get together often for meals and fun. Mikayla will do best with very confident parents who communicate expectations clearly, have a routine for her to follow, with some flexibility when necessary, and praise good behavior. She is seeking a forever family who will openly shower her with affection and remain committed to her through whatever challenges come.